The Stadium Taskforce Report seems to have put an end to the possibility of a new stadium being built in Brisbane using government funding, but could private financing come in to fill the breach? The report makes it clear that the government’s priorities are on upgrading Lang Park and The Gabba as well as developing the Brisbane Live District. Add to that the fact that there’s $90 billion worth of debt on the Queensland Government’s books and I think it’s safe to say that any financing for a new stadium will have to come from private investment. Here are a number of scenarios for how this could happen. The first and simplest way that a new stadium could be built with private money is if Brisbane Roar fund one for themselves. 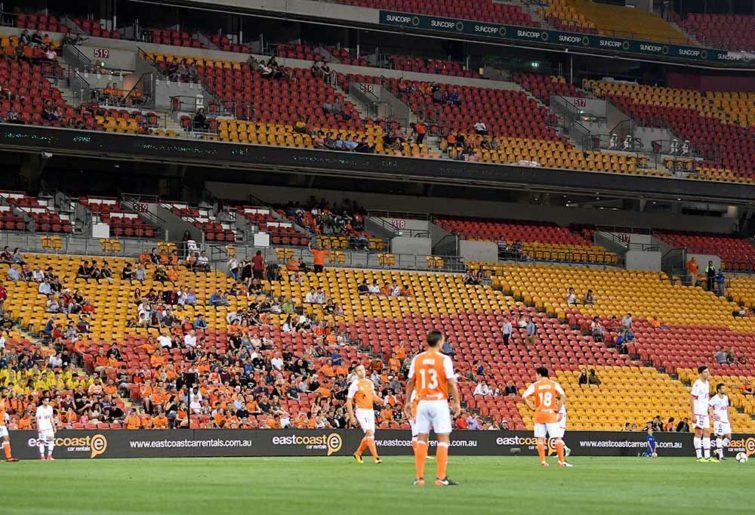 The owners of Brisbane Roar have said in the past that they want to turn the club into the biggest in Australia and have floated the possibility of building their own stadium in the past. The only trouble with this however is that the Bakrie Group have a record, both in Australia and in Indonesia, of missing player payments and super contributions. They have also been reported to have been nine billion dollars in debt at one point and they may not see building a stadium for the club as a high priority. During the expansion bidding process FFA encouraged bids that covered similar territories to combine their bids together. This is what happened in Campbelltown where United For Macarthur and South West Sydney FC merged to form a single “super bid” which went on to win a licence. Brisbane Strikers and Brisbane City refused to do this because they each wanted to stay at their own respective locations. But now that Ballymore is off the table maybe Brisbane City could change their minds and form a single bid with Strikers and redevelop Perry Park together with them. Sharing a stadium isn’t ideal but as long as both clubs have a clear identity it can be done successfully. In Serie A for example Lazio and Roma share Stadio Olympico, Genoa and Sampdoria share Stadio Luigi Ferraris and of course AC Milan and Inter Milan share San Siro. So, if Brisbane Strikers and Brisbane City formed a joint bid they would be seen as a northern club as both play on the north side of the river, while Brisbane Roar would be seen as a southern club as they have moved their training and administration facilities to Logan and have their origins in Lions at Richlands. This scenario might seem unlikely but it isn’t impossible either. If a joint Brisbane Strikers and Brisbane City bid don’t have the money to build a stadium by themselves then they could ask Roar to chip in too (if they are willing) and share any ongoing operating costs with them which could be paid for in savings from not having to pay exorbitant fees to use Lang Park. As mentioned earlier in the first scenario, the Bakrie Group have a mixed record in running clubs and Brisbane Roar are no exception. Their lack of real interest in running the club has been noted by others and in October 2017 a Russian consortium approached the Bakries and offered to take over the club for a price of over $10 million. The offer was turned down by the Bakries who wanted twice what they were offering, but they were prepared to sell for the right price. Player agent Buddy Farah who was representing the Russian consortium said that, “They see a good future with the Roar. Our offer is still on the table if they choose to reconsider.” No details are known about who they are or if they would be willing to build a stadium using their own money but the possibility of a new consortium taking over Brisbane Roar is certainly out there. Before the current round of expansion, the bid team representing Southern Expansion made approaches to Sydney FC, Western Sydney Wanderers and Central Coast Mariners making separate offers to take over each of them. Could they make an offer for Brisbane Roar whose license expires 5 years from now in 2024? Finally, another scenario that could unfold might be that a new consortium could start a new team. You never know, someone like Red Bull might pop up out of the blue and offer to build a stadium for a new club on the site of QSAC or out west in Ipswich. What are the actual chances? This is by no means a detailed or comprehensive examination of the way that a new stadium could actually be built in Brisbane. It’s just an overview of the different ways in which it might happen. Having said that, there are a number of plausible scenarios where a new stadium could be built using private investment, so it may well be possible. But if you’re looking for government funding, forget it.